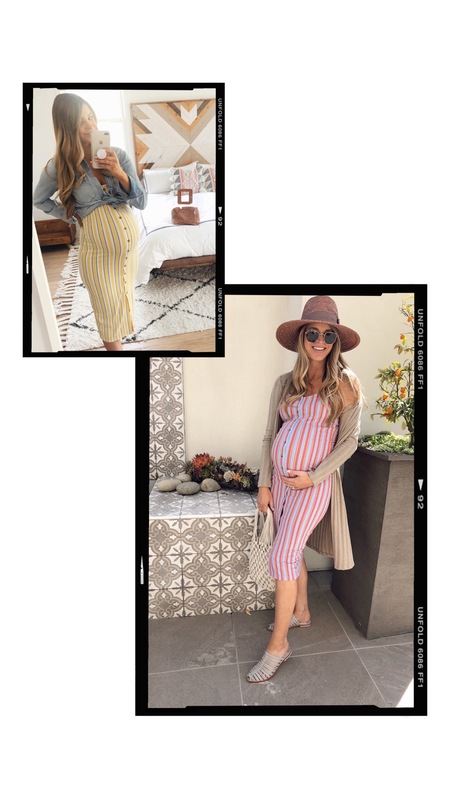 I’ve been doing a lot of my “maternity” shopping at Forever 21. I posted about it here a few weeks ago but went back for more last week and thought I’d update you with my latest haul. It’s seriously the best place to buy bump and budget friendly dresses. I typically go a size up and they’re still fitting me at 37 weeks. Here’s a little rundown of what I’ve picked up recently. I actually got this cute striped dress in the blue color first (pictured below) and loved it so much I went back for yellow. It’s so flattering and can be worn lots of ways… as seen in these pics. I tried this white dress on last month and had to go back for it. It’s so pretty and flattering… would be great for a baby shower! Ok this periwinkle dress is the best steal at $13! It comes in black too and is super soft and comfortable. Hope you had a great weekend – thank you for reading and following!